If you want to keep your home comfortable throughout the year, you need to get professional heating and air conditioning service in Lockbourne, OH from Quality Air Heating and Air Conditioning. We have years of experience and have worked with countless customers to bring them the high quality HVAC service that they deserve. We can work on a large range of heating and cooling systems including ductless mini splits, geothermal systems, heat pumps, central AC and, of course, furnaces of all types. Call us today if your home isn’t comfortable and you need heating or air conditioning repair in Lockbourne, OH. We’re available 24/7, so call us anytime. Heating is a big deal here in Ohio, where our winters can be quite fierce. If your heating system is causing you any problems, call us immediately for heating repair in Lockbourne, OH. If it’s new installation that you want, our technicians will ensure that you get a heater that is the right size for your home, that it operates safely, and that it is installed quickly. Call us today to talk with one of our Lockbourne, OH heating experts. If your heating system stops working for any reason, call Quality Air Heating and Air Conditioning for heating repair in Lockbourne, OH. We often get calls from our customers who decided to wait too long and their heater ended up developing very serious problems. We’re available 24/7 for heating repair in Lockbourne, OH so make sure that you call us as soon as you notice any problem with your heater. Spend just a few minutes online browsing through all the heating systems available and you’ll likely start to feel a little overwhelmed. But when you call Quality Air Heating and Air Conditioning for heating installation in Lockbourne, OH we can handle the entire process for you. Finding the right-sized heater is one of the most important steps of the entire process, and our technicians can perform the necessary calculations to figure out exactly what size your home needs. Call us today to talk with one of our Lockbourne, OH heating installation experts. Are you looking for a new air conditioner? Is your current AC system not operating properly anymore and you need repairs? Quality Air Heating and Air Conditioning is here to help with high quality air conditioning service in Lockbourne, OH. No matter what type of air conditioning system you already have or what type you need installed, the experts at Quality Air Heating and Air Conditioning can help with a full range of services. Call us today to talk to our staff of highly qualified air conditioning experts. Your air conditioning system isn’t immune to problems, as you’re likely aware of. Call Quality Air Heating and Air Conditioning when you need air conditioning repair in Lockbourne, OH. We’re available 24/7 because we understand that air conditioning systems can break down at any moment. If your AC is making a new noise, if it’s iced over or leaking water, just call Quality Air Heating and Air Conditioning and we can get it back up and working again fast-no matter what type of system you have. Buying a new air conditioning unit is no small matter. Your new system will hopefully last 10 or 15 years so you have to live with your decision for a long time. That’s why you should seek professional guidance from the Lockbourne, OH air conditioning installation professionals at Quality Air Heating and Air Conditioning. We’ll help you find a perfect AC system that fits in your budget and is a good match for your home’s size. Call us today if your air conditioner has failed permanently and you need a replacement or if you’re shopping for a brand new system for a new home. Maintenance isn’t just some gimmick that air conditioning companies come up with to squeeze every last penny out of their customers. Regular maintenance has huge potential benefits to homeowners including reduced repair needs, increased efficiency, and extended equipment life. Quality Air Heating and Air Conditioning offers total air conditioning maintenance in Lockbourne, OH for all types of systems. Our program includes regular tune-ups, reduced pricing, priority service, extended warranties and much more. Contact us today to find out more. It can be frustrating when your air conditioning system fails permanently and you have to go find a new one for your home. However, the process doesn’t have to be so stressful when you call Quality Air Heating and Air Conditioning. We provide total air conditioning replacement in Lockbourne, OH for all types of AC systems. We’ll make sure that your new unit is the perfect size for your home and that it operates efficiently and safely in your home. Call today. No matter what type of business you own, Quality Air Heating and Air Conditioning is dedicated to providing you with the high quality of commercial HVAC service in Lockbourne, OH that you deserve. We’ve worked with all types of businesses to help them keep their interior comfortable for their clients, customers, and employees. From installation and replacement to repair and maintenance, we offer a full line-up of high quality and professional services. Because of the near-constant use that your HVAC system gets throughout the day, it may develop a number of common problems. 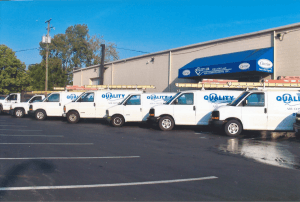 If your business isn’t getting enough heating or cooling or if your equipment is making any unfamiliar noises, just call Quality Air Heating and Air Conditioning for commercial HVAC repair in Lockbourne, OH. We stay focused on providing the best possible quality of workmanship. We’re available 24/7 for emergency commercial HVAC repair for those times when you need someone to get your HVAC system back up and working in the middle of the night. Don’t let anyone but a trained contractor install any of your new HVAC equipment. Poor installation is one of the main causes of problems with heating and air conditioning systems. Let Quality Air Heating and Air Conditioning handle your commercial HVAC installation in Lockbourne, OH and we’ll make sure to get your new equipment installed safely and quickly. No matter what type of heating and air conditioning system you need, our technicians can handle the job. Don’t forget to have your HVAC system regularly inspected and maintained by the professionals at Quality Air Heating and Air Conditioning. Doing so could help reduce the need for costly repairs, increase the efficiency of your equipment and also extend its life. Quality Air Heating and Air Conditioning proudly provides total commercial HVAC maintenance in Lockbourne, OH for businesses of all types. Our maintenance program grants our members access to many other perks including reduced pricing, extended warranties and much more. The heat pump is a popular choice for homeowners because of its efficiency and also because it provides both heating and cooling in one unit. If you’d like more information on heat pumps, call Quality Air Heating and Air Conditioning. We offer total heat pump services in Lockbourne, OH for all makes and models. We can install a new system in your home if your old one isn’t working anymore. We also provide 24/7 heat pump repair in Lockbourne, OH as well. Is your furnace squealing, rattling or making any other noises? Are you ready to have a new furnace installed in your home? Call the Lockbourne, OH furnace repair, installation, maintenance, and replacement experts at Quality Air Heating and Air Conditioning. We can work on all types of furnaces including electric, gas and propane models. Contact us today for all your furnace service in Lockbourne, OH.